The Triangle is the independent student newspaper of Drexel University in Philadelphia, Pennsylvania. Editions of the paper are printed early every Friday morning; they are distributed in buildings on Drexel's campus as well as in select locations in University City, Philadelphia. 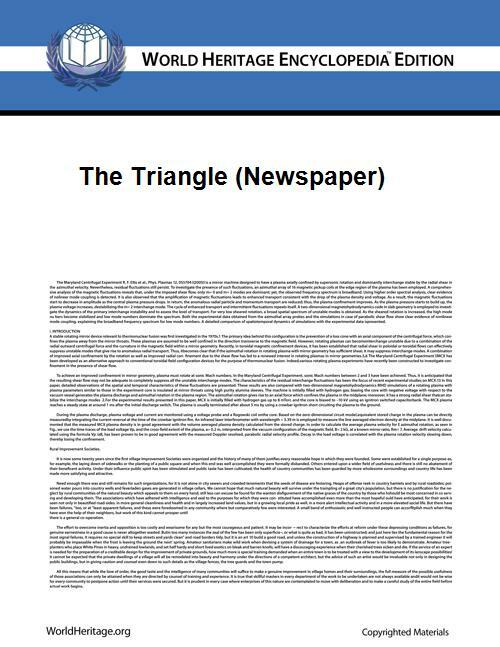 The Triangle was first published on February 1, 1926, under the direction of students with University advisors functioning only to offer advice. Publication has been on a weekly schedule during the academic school year with bi-weekly publication during summer. The Triangle began publishing in color in the summer of 2004. During the summer of 2007 publishing switched from tabloid to broadsheet format. Sections include News, Op-ed (also called Ed-op), Arts & Entertainment, Sports, Comics, and Classified ads. The Triangle has won several Mark of Excellence Awards which honor the best in Student Journalism from the Society of Professional Journalists. First place in Editorial Writing (2000), General Column Writing (2000), Second place in Editorial Writing (2001), and third place in Sports Column Writing (2001). In 2004 it won two National Pacemaker Awards for excellence in college newspapers. One of the paper's most notable former columnists is Chuck Barris. A 1953 graduate of Drexel, Barris, among other things, created and hosted The Gong Show, wrote Freddy Cannon's 1962 hit single "Palisades Park," and was the subject of the movie Confessions of a Dangerous Mind. John Gruber, creator of Daring Fireball was also a former columnist and past Editor-in-Chief. ^ "The Triangle Staff List". The Triangle. October 21, 2014. Retrieved 2014-10-21. ^ "Advertising Guide" (PDF). The Triangle. 2011. Retrieved 2012-06-06. ^ "Drexel's Media Outlets Inform and Entertain Students and Philadelphia". Drexelink. August 5, 2004. Retrieved 2008-02-20. ^ a b "Society of Professional Journalists: Mark of Excellence Awards". Society of Professional Journalists. Retrieved 2007-04-13. ^ "2004 ACP Newspaper Pacemaker Winners". Associated Collegiate Press. 2004. Retrieved 2008-08-13.